Pallet trucks are built to be both sturdy and reliable, delivering high levels of performance in the harsh conditions in which they are deployed. Despite this, standard models of pallet trucks have one major weakness. This weakness it that these pallet trucks perform at a lower level and deteriorate in colder storage conditions. When operating in pallet trucks in cold environments, many companies make use of several pallet trucks which are rotated. However this practice can actually compromise safety, equipment and also productivity. When rotating pallet trucks in cold environments, there are a number measures which companies can employ in order to minimize these risks. These measures begin with ensuring that the equipment which will be used in cold environments is equipped with additional security and protection features. “It is a common mistake for companies to neglect this step,” warned Jeff Bowles, who is product line manager for Mitsubishi Caterpillar Forklift America. He revealed that a large number of modern manufacturers of electric pallet trucks generally ensure that a high level of protection is provided for electrical components within the standard chassis. “However, not every standard chassis is designed to withstand the conditions within cold storage areas. Due to this, optional storage packages are available and should be purchased.” Bowles explained. Furthermore, some alternative electrical components and attachments which perform well in ambient conditions may not perform well or be incompatible in cold conditions. Due to this it is imperative to ensure that expensive pallet truck and forklift truck equipment is not exposed to conditions which will shorten its life or reduce its effectiveness. Once the chassis, the most important part of a pallet truck, has been correctly protected it is time to attend to the other components. These other components which will improve the trucks functionality in cold environments, include softer tyre compositions, lighter weight hydraulic oil and anti-slip/anti-skid technology. This technology supports traction and reduces the amount of wear on the trucks tyres. 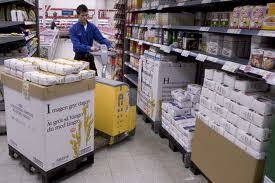 Quite often in cold environments a narrow aisle system is employed. This is because this system enables for a larger amount of stock to be stored. However, as the amount of pallet trucks and related traffic within the storage facility increases manoeuvrability can become a major issue. In cases where truck movement between cold areas and ambient areas cannot be avoided, it is best practice to first move from a freezer environment to a cooler environment before using the truck in an ambient environment. Utilising this method will dramatically reduce the potential for condensation and corrosion to appear and form on the trucks components. This entry was posted in Handling Equipment and tagged pallet trucks in cold environments on January 6, 2014 by admin.